Wow, it's been a while since I posted any recipes on here! That's because we've mostly been living on pancakes and grilled cheese sandwiches at our house. This mama doesn't like to cook when she's pregnant, at least not at the beginning. Now that I feel like eating somewhat normal food again, the cooking (and the recipes) will resume. 1. In a large pot, boil water for your tortellini. You'll cook it (according to pkg directions) before adding it to the soup. 2. In another pot, saute onion in olive oil until tender. Add garlic and cook a minute more. 3. Add tomatoes, soup, broth, onion & garlic powders, basil & pesto. Bring to a boil. 4. 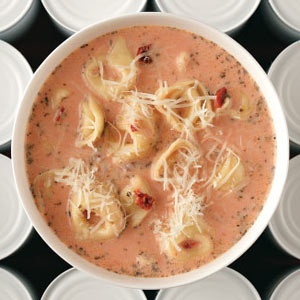 Reduce heat and add milk and cooked tortellini. 5. Ladle into bowls and top with parmesan.